The World of Slimming (trying to slim with Slimming World): How it feels to have a "maintain"
I ate out at least 8 times (possibly 9) between weighing in on 27th November and again on 4th December. I had a week off work; a trip to London, a 4 day break in Brussels and a visit from an old friend. But I didn't put on weight! 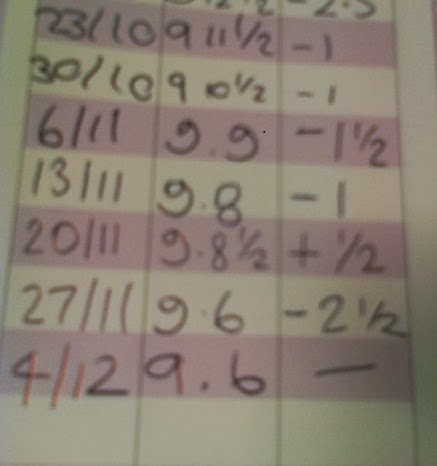 This week I weighed in at 9st6lbs (the same as last week), and I feel pretty good about it. I feel confident that I made some really good choices when eating out, I reigned it back in quickly after indulging (when I did indulge) and I did heaps more walking then I would have had I been sat at my desk for the week. If I'd tried my best and had a normal week and had a maintain I wonder if I would feel differently. I was gutted after my gain a couple of weeks ago, but my hard work showed the following week with a 2.5lb loss. This is now week 9 of Slimming World for me, and I have lost 9lbs in the last 8 weeks. Sometimes its tough, but mostly I just want the results so badly that its worth the occasional grumpy me when I can't have a pudding or something.